The team which allowed more goals during the regular season changed coach in October already, but it did not help. KHL.ru reviews Slovan’s 2017/2018 season. Long losing streaks, serious defensive problems and weak game away from home: this is exactly what Slovan lacked to get to the playoffs. If last year the Bratislava Eagles finished the season close to the top-eight, this season Slovan finished as the second least team in the Western Conference, ending up higher only than Dinamo Riga. One year ago, the Slovak team’s season was ruined by injuries and Slovan had a competitive roster, being able to defeat Ak Bars Kazan, Salavat Yulaev Ufa, and Lokomotiv Yaroslavl. The board’s decision to confirm Milos Riha as the team’s head coach looked like a logical step. However, as a result, the team had its worst season ever in the KHL by points and goals scored. The season started not the right way since the very start, as after two games the total score was 2:12 after facing SKA and Lokomotiv. By October’s start, Slovan had only five wins in 18 games and after a shutout home defeat against Torpedo Nizhny Novgorod, Riha was fired. 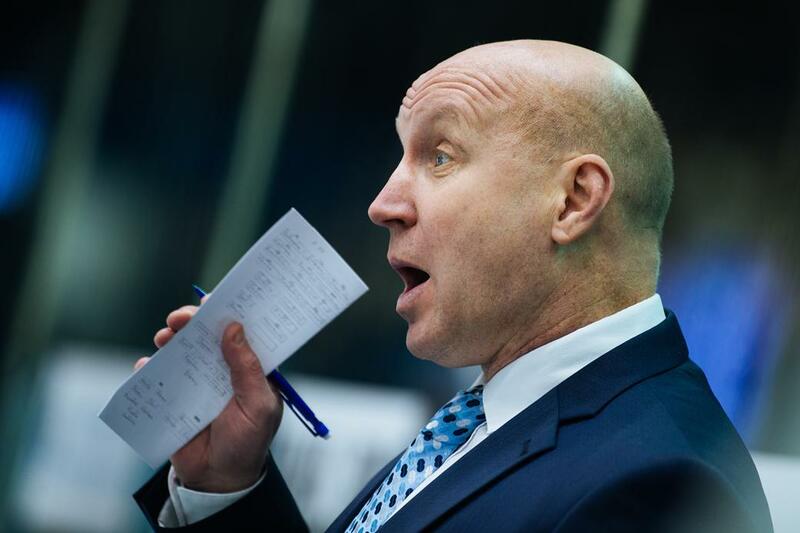 To replace him, the Belarusian specialist Eduard Zankovets was hired, after his great 2016/2017 with Barys Astana, when he led an unknown team in September to get it to the second round of the Gagarin Cup playoffs. No one was expecting any miracle from Zankovets, but under his guidance, chances were good to at least revert some momentum. But it didn’t happen. Under the new coach, the results didn’t improve. The team from Bratislava kept on going down and down in the standings, allowing too many goals and showing a poor game in the away games. A short, bright period happened between December 26 and January 19, where the team had five wins in seven games, but it wasn’t enough to get closer to the playoffs zone, it would have been impossible to save the situation. There were some problems also with the lineup. Jakub Stepanek generally coped with his role of starting goalkeeper, but the team failed to find a reliable backup. The team’s leader, Lukas Kaspar, didn’t show his best hockey due to injuries. Moreover, in October the team’s top scorer Radek Smolenak left the team as he didn’t fall into Eduard Zankovets’ game plan. The result is now quite obvious. Slovan’s season fell into the “forget as soon as possible” column. Slovan started the season under the guidance of Milos Riha, a coach who managed to get to the Gagarin Cup finals and won the Slovak Extraleague title with Slovan. Riha was fired in October and was replaced by the 49-year-old Eduard Zankovets. He worked many years in his native Belarus, including with the national team, and was part of the coaching staff in SKA and Avangard. The specialist was hired as new Slovan Bratislava head coach after his successful experience with Barys Astana. Every team, even in the worst season, has some bright games. Slovan had several games like this, especially at home. The best one was probably the January 9 game against Metallurg Magnitogorsk. The game had many penalties, the refs were whistling a lot that night, but the key moment happened in even strength. In thirty minutes, the home team scored three times on Vasily Koshechkin, Ilya Samsonov replaced him, but nothing changed on the scoreboard and Slovan had a deserved win. It’s hard to pick a particularly bad game right away since Slovan had so many of these in the last season. Slovan was heavily defeated by Vityaz, and Spartak, had a shutout loss against Barys and Kunlun, but the Slovaks had the soundest defeats against SKA. The team lost both games with a 6-goal difference. The first loss was on the regular season’s first day, on August 23, when Slovan lost 1:7 in St. Petersburg. After a few months, in December, the Eagles simply could not stop the reigning KHL champions and allowed eight goals, scoring only two. During an interview published on KHL.ru, Eduard Zankovets praised a group of young Slovak players, including the 21-year-old Boris Sadecky. He probably cannot be called a true discovery, but his goal against Lokomotiv Yaroslavl was named the best goal of the regular season. Michal Repik is a better option. He didn’t have the best plus/minus stat, but he was the team’s top goal scorer and doubled his best result in points scored in the KHL. This is one of those cases where calling names is not an option. For Slovan, their fans, the coaches, and the boards it has been a true disappointment. Surely, the Eagles will want to rehabilitate their name next year.